I am geared up for digging and planting in my small townhouse garden! Gardening is a lovely hobby to rest my eyes from all the computer work I have to do everyday. I love to get my hands in dirt, walking through nurseries and discovering what plants will thrive and which will not in my Zone 8. But before I set out to dig, I called my local utilities. Every month our local utility company always puts out a a reminder notice with the bill: “call before you dig”. You want to make sure you do not strike a gas line or other utilities that can really create a serious situation and costly repairs. So it goes with remodeling your kitchen when it comes to relocating utilities. Are you on slab foundation? Houses with underground utilities on slab foundation require more extensive work relocating utilities compared to houses built on raised foundation. Start with your local building department or plan check department. This brings to mind one of the projects I am working on right now. I called the local building dept to check if our client’s home had Post Tension Cables in the concrete slab. Post-tensioning is a method of strengthening concrete using high-strength steel strands or cables, typically referred to as tendons. 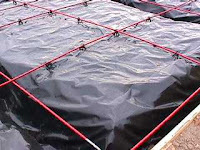 If you have a slab on grade foundation, check to see if your house has post tension cables in the concrete foundation. One item of note: our local building dept. commented that sometimes they may or may not have a record if a house has Post Tension Cables. Most newer homes will have them. Error on the side of caution always. It is worth the cost of having your slab ex-rayed for a few hundred dollars compared to repairs that can run in the thousands. 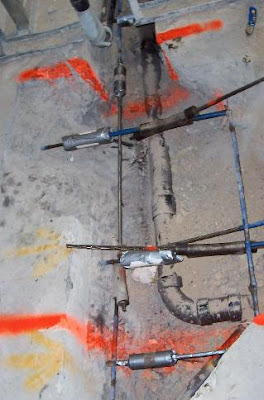 If you do have PTC in your foundation call in a company that will be able to x-ray the slab. The grid pattern has to be mapped out on the floor before trenching begins. Once the PTC grid pattern is mapped, then the concrete has to be cut, holes bored through between each cable grid to core through the earth and tunneled below the cables. The work is strenuous, time consuming and expensive but worth the extra effort if it means taking a dysfunctional kitchen to a exceptional functional entertainers dream kitchen. In the long run, the investment will be worth it if you look at it in terms of dollar cost averaging the expense divided into the years of enjoyment you and your family live in your home. Here is a video showing PTC placed into the foundation. A worker cutting a tendon tail in a poured concrete foundation. A sheathed cable is laid through each interior beam before the slab is poured. This shows the damage that saw cutting and jack hammering can do to existing post-tension cables. Out of 18 exposed post-tension cables, 14 were broken.